AUGUSTA, Maine — State Rep. Matt Moonen, D-Portland, said Monday that a bill he’s authored to change the way the state selects a replacement U.S. senator in the event of a vacancy has nothing to do with gubernatorial politics. Moonen’s bill was the source of speculation that Democrats were concerned U.S. Sen. Susan Collins, R-Maine, might seek the governor’s office in 2018, which would allow Republican Gov. Paul LePage to appoint her replacement. Moonen was critical of the media coverage of his bill, LD 850, saying reports suggesting it was meant to prevent LePage from appointing a replacement were “speculative” and “frustrating.” The bill is the only measure Moonen has sponsored this session. “The media seems to want to speculate and gossip about hypothetical scenarios about Sen. Collins running for governor and say this bill is all about her,” Moonen told the Legislature’s Veterans and Legal Affairs Committee. “Because she was just re-elected to the job she has now and the job that she likes,” Moonen said. He said just like a proposal being offered by Gov. Paul LePage to have voters select the state’s constitutional officers — currently they are elected by the Legislature — his proposal is about allowing voters to select a replacement senator. Federal law requires voters to select a replacement for U.S. representatives when there is an unexpected vacancy, and Moonen said he feels U.S. Senate vacancies should be treated the same way. Under current state law, the governor’s appointee serves until the next statewide general election, setting up the possibility of a two-year Senate term for an appointee depending on when the vacancy occurs, Moonen said. “If the voters should get to weigh in on the attorney general, then they should also get to weigh in on a two-and-a-half-year term in the U.S. Senate,” he said. Moonen’s bill strips the power to appoint a U.S. senator from the governor’s office and replaces that with a process that includes a special primary and special general election. If the state changed its method for appointing a U.S. Senate replacement with a special general election, it would join 14 states that do the same. The other 36 states allow the governor or the legislature to appoint a replacement and many of those states require that replacement come from the same party as the senator they are replacing. Maine Deputy Secretary of State Julie Flynn told the committee her office was neither for nor against the bill but the cost of holding a special statewide primary and general election would be about $300,000. She said it was a cost the state did not budget for because it’s impossible to predict those kinds of unexpected vacancies. 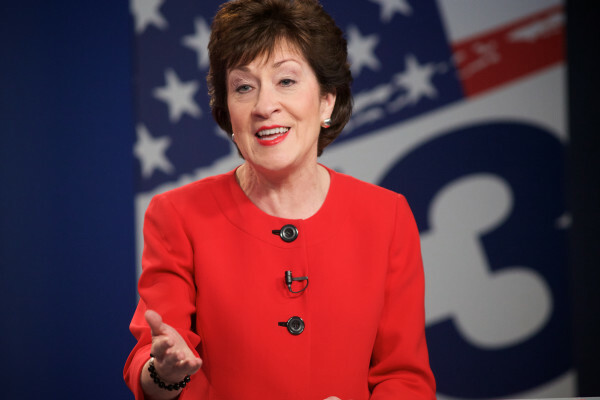 But Flynn said the timeline prescribed in Moonen’s bill, which requires a special primary within 100 days of the vacancy followed by a special statewide election, could leave Maine with only one U.S. senator for as long as seven months. “That process would take about 200 days to have both of those elections,” Flynn said. The last time a Maine governor appointed a U.S. senator was in May 1980 when Democratic Gov. Joseph Brennan appointed George Mitchell to finish the term of Ed Muskie. Muskie, a Rumford native, had been appointed secretary of state by President Jimmy Carter. “Politics with these kinds of issues are tricky. No party wants to give up an advantage that they have, and I can understand that,” Moonen said. But he added that now was the right time to tackle the issue because Sen. Angus King has four years left to serve and Collins has almost six. That situation allows lawmakers to focus on what is the best policy for the state, “which is whether or not the voters should be able to weigh in on this and not who the current law would give the advantage to based on who is in the governor’s office,” Moonen said. Moonen’s bill will face additional scrutiny with the committee and before the full Legislature in the days ahead.